Sony, being a camera maker as well as a smartphone manufacturer, should have the smartphone-camera market pretty much sewn up. But with Nokia continuing to shine in this particular department, it would appear as though the Japanese electronics giant is about to step up its game. A leaked presentation slide of the rumored “Honami” handset suggests the device could be capable of shooting 4K video, and with the company’s PlayStation 4 console set to be a vital part of the Ultra HD revolution, we certainly wouldn’t discount these claims with haste. Considering the leak has been sourced fro a user of China’s Twitter incarnate Weibo, we have to proceed with a fair amount of caution, but with Sony’s Xperia range having struggled amid a sea of Samsung smartphones, perhaps the company is looking to do what HTC did with the One, and reignite consumer interests. 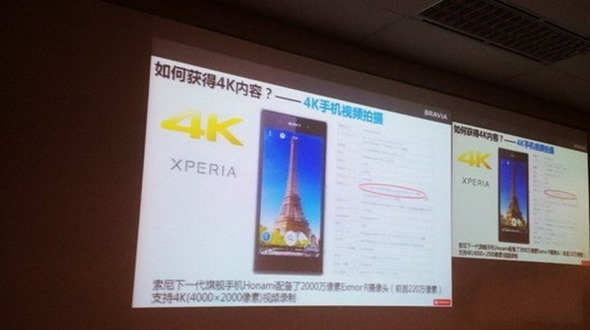 The Weibo leak offers little more than a snap of a Sony device, along with information that it will be capable of recording 4K videos. Considering that 1080p video capture is currently the norm with most high-end smartphones, this would be a fairly significant step up, and with rumors pointing towards what would equate to a very impressive list of specs for the Sony Honami, it could really be one for photography aficionados to keep an eye out for, and for good reason. Apparently, it’ll arrive with a large, 5-inch HD display, which does place it rather close to phablet territory. The device could also be powered by a Snapdragon 800 processor, with a 20.7-megapixel main snapper to the rear. Although the form factor, by the looks of the leaked images, doesn’t deviate much from the Xperia Z, Sony looks to be making amends by really pushing the boundaries with regards to internal hardware. Nokia has really thrown down the gauntlet to the rest of the market with the recent unveiling of the Lumia 1020, packing a 41-megapixel camera. Although a little top-heavy thanks to the shot-taking hardware packed within its aluminum body, its photography credentials greatly exceed anything else on offer, so if there is any truth in the Sony Honami’s 4K abilities, we could have an interesting battle on our hands.